Cost: Student $20, Non Members $65. 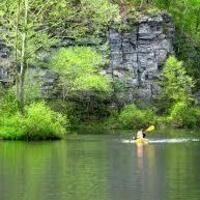 Cost includes kayak, life jacket, paddle, round trip transportation, camping gear, and meals while not on the road. Have you ever wanted to go kayaking? Let the outdoor adventure program lead you through the Lower Mountain Fork near Broken Bow Oklahoma, where the crystal clear water is exaggerated by the surrounding mountain scenery. This river is known for some of the best rapids in all of Oklahoma. The picturesque scenery combined with our knowledgeable staff makes this an enjoyable trip for anyone regardless of their skill level or experience. Come enjoy a beautiful day on the water for a trip you will never forget. * Participants will be required to attend a pre-trip meeting and a clinic at Cain pond on 04/15 from 4-6pm.